Costanza has never been good with names. Amazingly, his mind can twist a name from Memo to Ramone or Salade de Fruits to Pomme Frites. Yah, go figure. 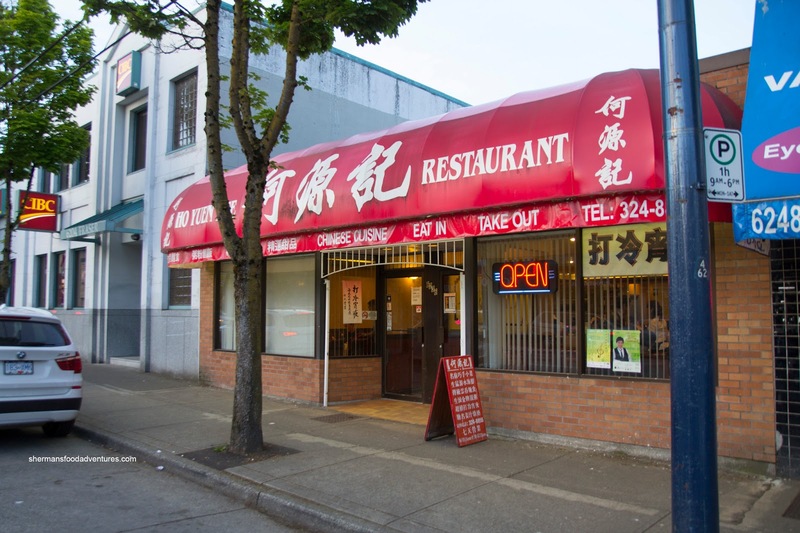 So when he remarked how his co-worker had raved about a Chinese restaurant called something "Yuen", that didn't really didn't help me decipher what it was. First, I needed a location and second, was "Yuen" really in the name? 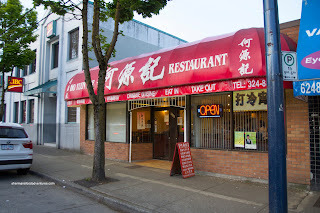 Well, I finally was able to figure out that it was Ho Yuen Kee out on Fraser Street. Well, he wanted to try it out much to my chagrin. Great. 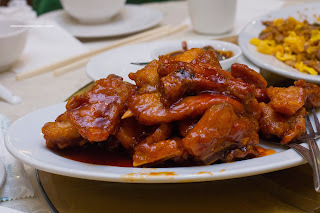 The place where I ordered Peking Pork Chops and instead, received Sweet & Sour Spareribs. That wasn't the biggest issue, it was how the manager argued that we ordered the wrong thing. But whatever, I was willing to do a return visit because the food is generally pretty good there. Since we had the kiddies with us, ordering the Peking Duck was a given. The first course was the classic crispy skin with flour crepes. The skin was crispy with a pleasing colour. There was a bit of moist and tasty meat attached to each piece. We liked how the layer of fat was not that noticeable, even with the breast portion. The crepes were pan-fried, then steamed version, which meant they were not the fluffiest, but they did hold up and didn't dry out much. When we were deciding what to order, I tried convincing Costanza and Elaine to try out the wontons. Thinking back, I believe these are some of the best in the city. We went ahead with a large Wonton Soup and it was massive at 24 of them. These large puppies were filled with mostly whole shrimp which had a beautiful snap texture. 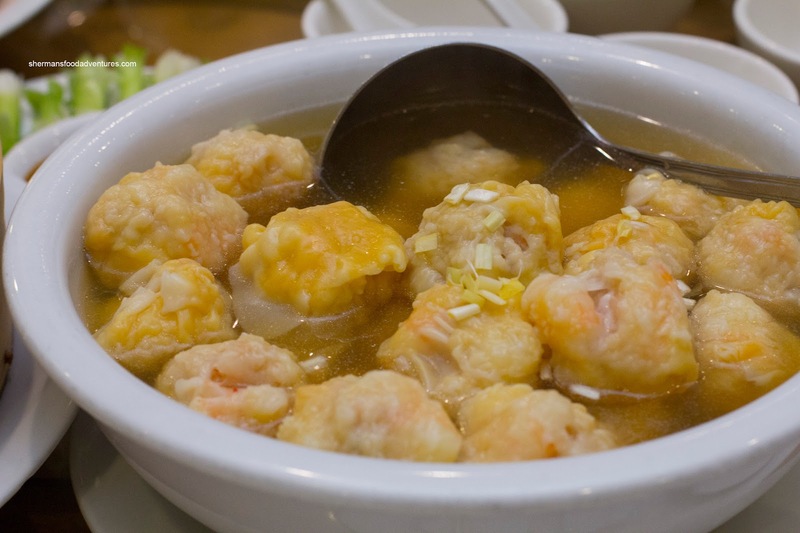 They were not overseasoned, so that the natural flavour of the shrimp was noticeable. Onto another signature item, we had the Crab on Fried Rice. Their more popular version is made with lobster, but we didn't feel like eating lobster or paying for it either. For such a seemingly simple dish, it was pretty darn good. 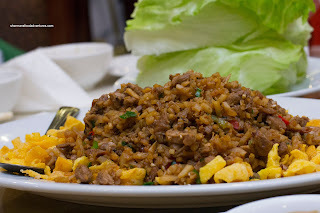 The chewy rice was stir-fried with corn and tobiko which meant there was plenty of sweetness and pop. 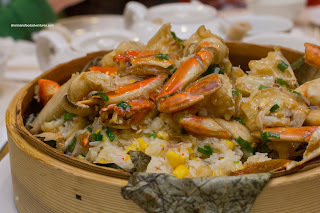 Some of the crab juices (aided by salt and MSG) were infused with the rice, creating another layer of flavour. The crab itself was fluffy and the seasoning had penetrated into the meat. The second course of the Peking Duck (being the Duck Lettuce Wrap) arrived with some pretty ugly cuts of lettuce. No matter because the filling was pretty good. 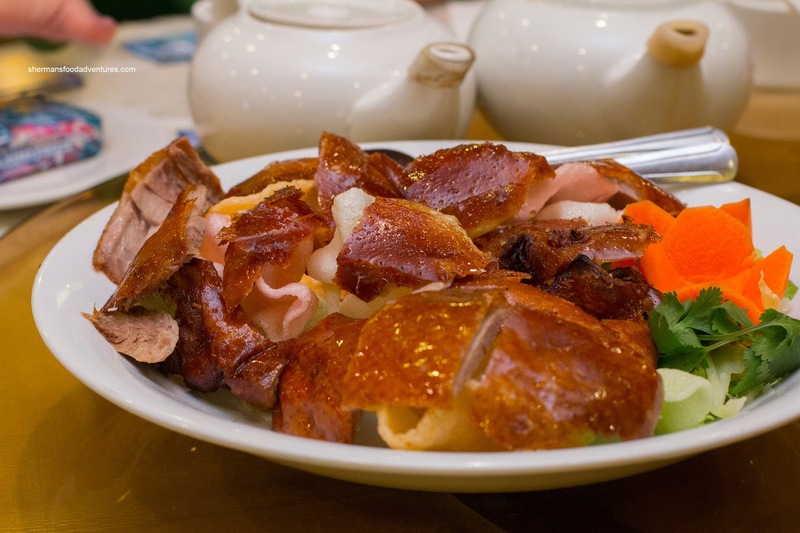 Unlike some other versions, there was more duck than anything else. Being that it was moist to begin with, this made the dish successful. However, with so much duck, the filling did lack a bit of crunch. Okay, here we go, the Peking Pork Chops. Yes, that dish. This time, they got it right with actual pork chops rather than spareribs. The meat itself was tenderized so it was easy to chew. However, there were some pieces which were just a bit underdone. The sauce was mild and mostly sweet lacking in tang. 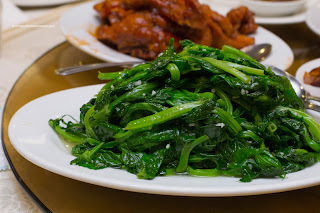 Lastly, we got our veggies in the form of Stir-Fried Pea Shoots with garlic. We found this dish too greasy while the pea shoots being just ever-so-slightly over-cooked. However, they were still tender and seasoned properly. Once again, the meal was generally pretty good highlighted by their signature dishes. Yet, the other 2 were just okay. The service we got wasn't bad per se, but it was sparse due to the full restaurant. Prices are pretty high for this class of restaurant, but well worth it if you pick the right dishes.